Ross McKitrick and Tom Adams have authored What Goes Up…Ontario’s Soaring Electricity Prices and How to Get Them Down for The Fraser Institute. It purports to be an analysis of the effect government contracts with electricity producers have had on Ontario's power bills. According to McKitrick and Adams, a large portion of the increase in these bills is due to the Green Energy Act, and in particular to the installation of wind farms that the act encouraged. Response to the study has been limited, but typically uncritical . The Canadian Wind Energy Association has promised a rebuttal, but until that happens I thought I would offer a few thoughts of my own. The study offers an econometric model designed to explain the "Global Adjustment", which is a monthly charge added to Ontario power bills to pay for the cost for providing both adequate generating capacity and conservation programs. The GA has been rising over the past decade or so, even as the market driven portion of the bill, the Hourly Ontario Energy Price or HOEP, has fallen. At the same time, the installed capacity of wind and has also risen and so, naturally enough, has been the urge to link these facts together. Adams and McKitrick fire up their econometric model and use it to crank out a couple of tables. This fellow thinks they contain an error or two, but for my purposes such details aren't really that important. Their first attempt at running the model is represented by Table 3 in the report. You can read what they say about Table 3 through the link, but the bottom line is that they don't like the result it gives them for wind energy; it is not sufficiently alarming. What this purports to show us is that where we have greater wind capacity, we have a higher Global Adjustment. But of course we already know this because, as I noted above, we already know during the last decade or so both installed wind capacity and the GA have increased concurrently. And if you look at the data from whence the chart was derived--this for the GA, and this for wind capacity--it's just basic time-series stuff. What the GA was at a certain date; how much wind capacity was installed at a specific date. And so if you graphically represented this information as a time-series chart rather than a scattergram you would get a graph with two lines on it, one representing the GA and one wind capacity. They would both start low on the y axis at earlier dates and rise gradually as you moved date by date along the x axis, closer and closer to the present. Which, again, we knew already. [Tom] Adams said the real effect of the wind and solar investments on bills has yet to sting ratepayers but will drive up prices over the next few years. So it is difficult for me to see why he would change his tune based on a single graph containing no new information. But onward and upward! Tom and Ross adjust their model for the assumption that wind generators also get paid for capacity. And hey presto! we get Table 4! Suddenly wind-power is driving the increase in the GA. But there is a problem with this reasoning. Though the model assumes that wind generators get paid both for capacity and generation, there are no contracts out there with this in their terms. Therefore Adams and McKitrick have to postulate a series of secret contracts, side deals, off-the-books stuff. And I suppose further investigation might turn up such evidence. But at the moment the McKitrick/Adams conspiracy theory is just an unsupported assumption needed to justify the result they would prefer their model gave them. Did McKitrick make sure that he hadn't mixed up degrees and radians in this analysis? Shorn of Fraser's wooly minded apophenia, the problem is simply that , as conservtionist resist energy price cuts, lest they spur power consumption , the Green buresucracy resists passing savings along to ratepayers. Thanks for your interest. 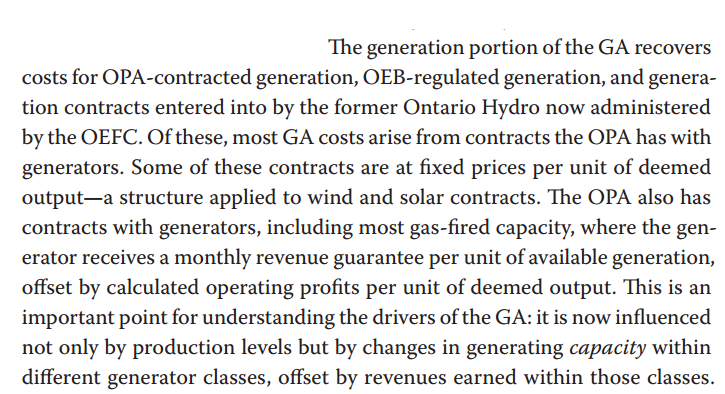 I might clarify my intention in commenting that the rate impact on Ontario consumers in 2013/14 of power from wind, solar, and raccoon turds was small potatoes. My point was that the cost impact on consumers in future from this junk generation will be much greater. As for your theory that we rely on "conspiracy theories", I'll let the model results speak for themselves.